The seeds of Pacific Gas & Electric were sown in Los Angeles back in 1966 when self-taught guitarist Tom Marshall formed Bluesberry Jam, whose ranks included drummer Charlie Allen. Allen turned out to be such a fine vocalist that he ended up becoming the frontman; his drum chair was filled by Adolfo de la Parra in 1968. Later that year, de La Parra left to join Canned Heat, replacing Frank Cook who then joined Bluesberry Jam. 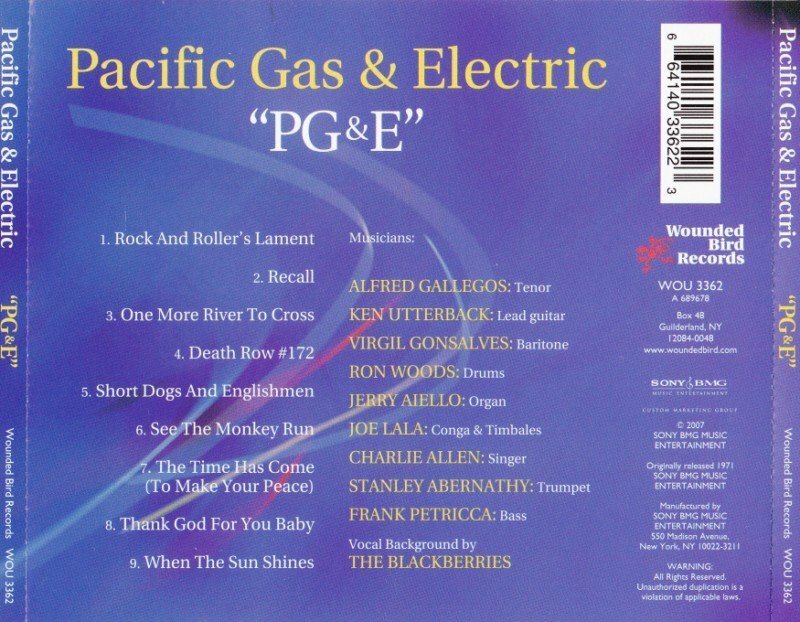 After adding guitarist Glenn Schwartz and bassist Brent Block later in 1968, the group changed their name to Pacific Gas & Electric. Pacific Gas and Electric Their first album, Get It On, was released by Kent in 1968, but failed to make much of an impact. However, following their appearance at the Miami Pop Festival in late 1968, Pacific Gas & Electric signed with Columbia, who released Pacific Gas & Electric in 1969. Their next album, Are You Ready, supplied their first hit, the title track, which made it into the Top 20 in the summer of 1970. Despite this success, all the bandmembers left, forcing Charlie Allen to build a new Pacific Gas & Electric around him. Enter guitarist Ken Utterback, bassist Frank Petricca, Ron Woods on drums, Jerry Aiello on keyboards, trumpet player Stanley Abernathy, sax players Alfred Gallegos and Virgil Gonsalves, and percussionist Joe Lala. 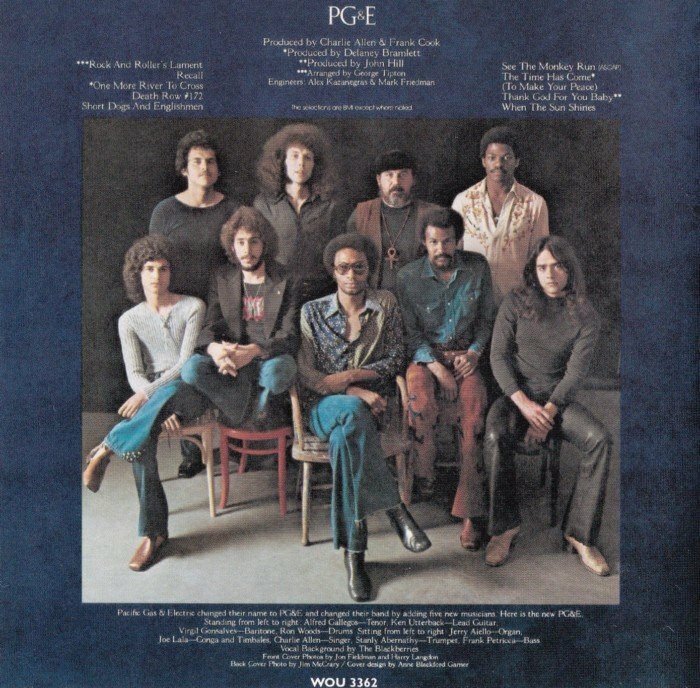 Around this time, the Pacific Gas & Electric Utility Company asked the band to change their name, which was shortened to PG&E, also the title of their 1971 album. They also appeared in and provided music for the Otto Preminger film Tell Me That You Love Me, Junie Moon starring Liza Minnelli. 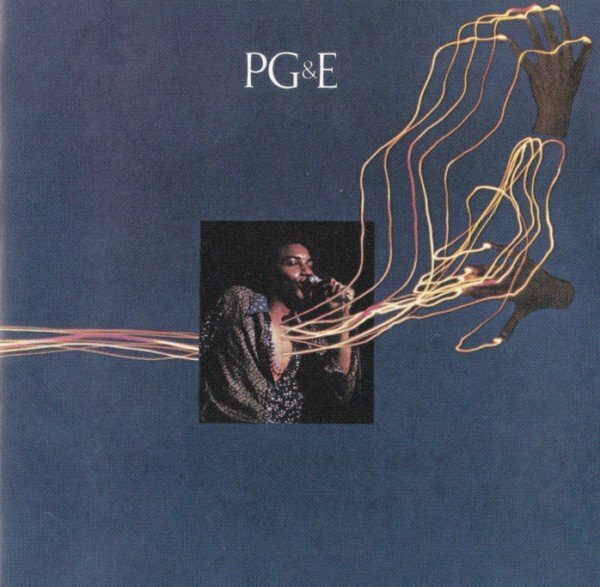 After 1972 or so, PG&E basically turned into a solo Charlie Allen vehicle. They released Starring Charlie Allen on Dunhill in 1973, then called it quits.